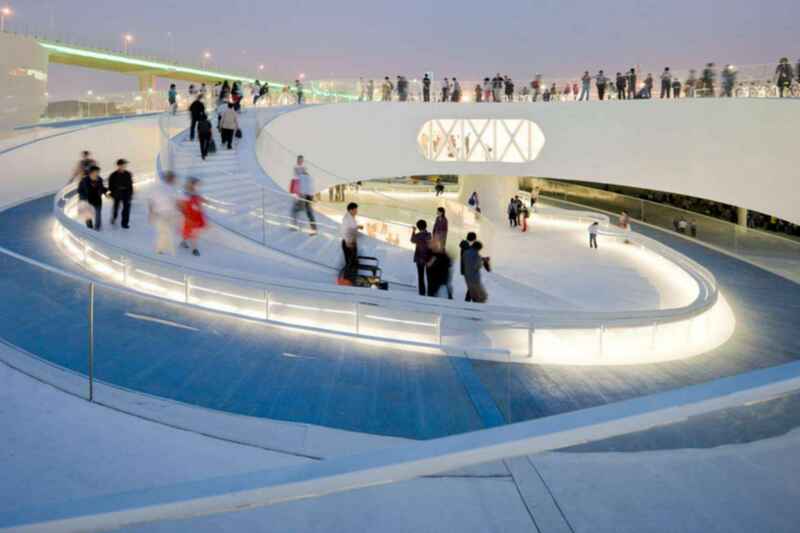 The pavilion is a big loop on which visitors ride around on one of the 1,500 bikes available at the entrance, a chance to experience the Danish urban way. At the center of the pavilion is a big pool with fresh water from Copenhagen's harbor, in which visitors can swim in, complete with The Little Mermaid statue centerpiece of Denmark. The pavilion is a monolithic structure in white painted steel which keeps it cool during the Shanghai summer sun due to its heat-reflecting characteristics. The roof is covered with a light blue surfacing texture, known from Danish cycle paths. Inside, the floor is covered with light epoxy and also features the blue cycle path where the bikes pass through the building. The steel of the facade is perforated in a pattern that reflects the actual structural stresses that the pavilion is experiencing making it a 1:1 stress test. "Sustainability is often misunderstood as the neo-protestant notion "that it has to hurt in order to do good". Ingels shows that a sustainable life can be attractive, fun, and desirable, and in fact increase the quality of life.